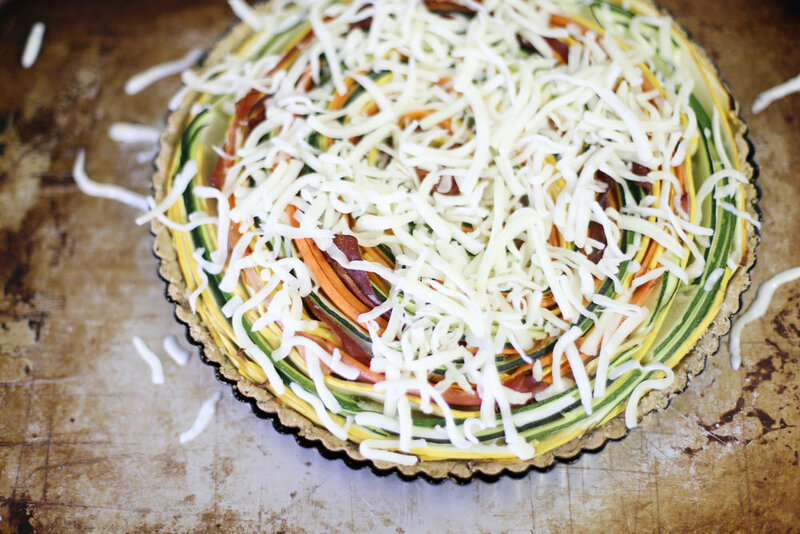 Since I knew last week was going to be hectic, and I knew I needed to have something ready for lunch everyday that I wouldn't have to think about or I wouldn't eat, so I made this beautiful savory-veggie tart. Doesn't it make your mouth water just looking at it? It couldn't have been easier to make, and it's so easy to re-heat at the office for a delectable lunch. I ate mine with a fried egg and rotisserie chicken, I felt like I was having a fancy Sunday brunch Monday-Friday, sans the mimosas (if only it were still Mad Men days)! 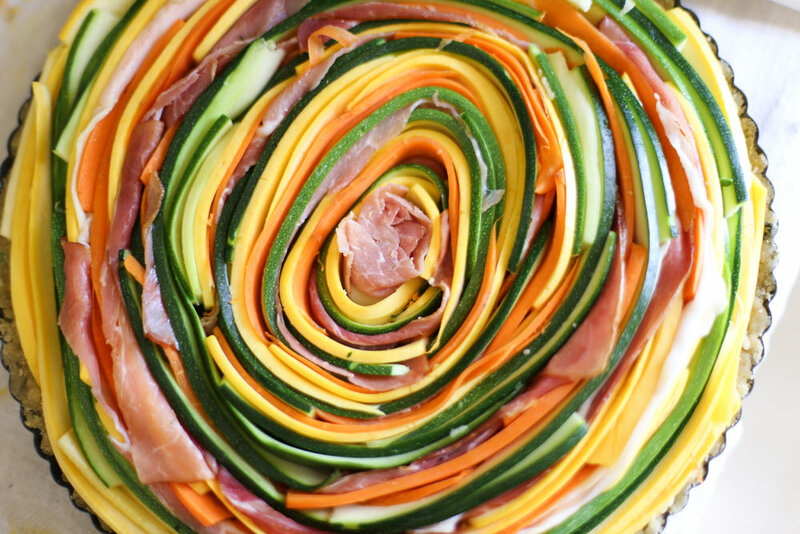 This is the perfect summer to fall lunch, with yellow squash, zucchini, carrots, prosciutto, and cheese all wrapped in an olive oil-wheat crust, it's a perfect mix of vibrant, savory flavors and sweet veggies. It's the ideal make a head lunch! If you're not the eat-the-same-thing-everyday type, it freezes great, just wrap in parchment paper and stick in individual ziplocks, it will defrost by lunch time and it's great heated in the toaster oven. let cool, either enjoy it right a way, or let cool completely, wrap in individual packages and freeze or store in the fridge. 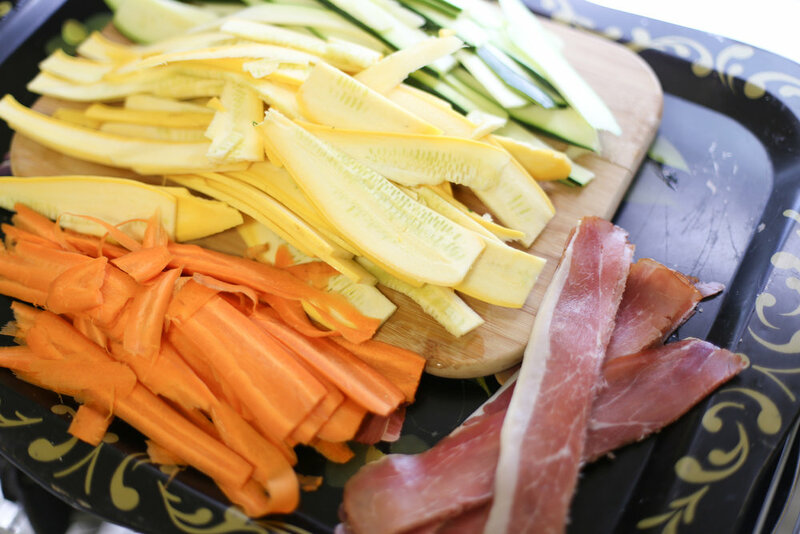 *to slice the veggies so they're about the appropriate hight, cut the squash in half, then slice with cut side down (if using a traditional knife) or with the cut side out to one side or the other (if using an mandolin).